Your Design is Our Blueprint! ﻿​﻿Have your ever combed stores searching for that perfect table? Or spent the entire afternoon surfing the web only to find out that the cabinet you picked out doesn't fit? It seems we can never find exactly what we want. We can spend hours of our time trying to find that one particular piece that fits perfectly in our home. We get frustrated and sometimes give up and just settle for something that we don't really want, but think we can live with for a while. Don't waste your hard earned money on something you don't want! Call us today! We can make that perfect table or custom fit a cabinet for you. You don't have to spend hours searching. The answer is right here! 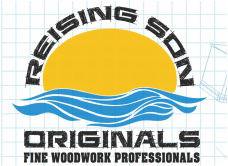 Reising Son Originals provides customers with custom, hand crafted works of art that last for years. Our pieces are specifically designed with the customer in mind. Each one is unique and made to order. 5102 Middle Mount Vernon Rd.